A 41-year-old man and a 29-year-old woman face felony charges after a May 7 bar fight at the Anchor Inn Bar, 3007 Gulf Drive, Holmes Beach. According to the probable cause affidavit, Richard Hasbrouck was the aggressor in a scuffle with another man at the bar. While Hasbrouck was physically engaged with another patron, Kristi Kovaleski allegedly hit a third man with a bar stool, causing swelling and bleeding to the victim’s hand. During a search of Hasbrouck following his arrest for misdemeanor battery, police allegedly found 1.3 grams of cocaine in his pocket. Hasbrouck was arrested for misdemeanor battery and felony possession of cocaine. He was booked into the Manatee County jail on $2,000 bond and, as of Islander press time, he remained in custody. Kovaleski was arrested on a felony battery charge. She was booked into the jail and held on $1,500 bond. 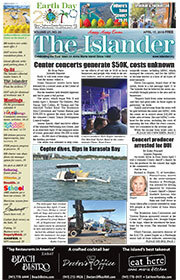 As of Islander press time, she remained in custody. Both Hasbrouck and Kovaleski were scheduled to be arraigned at 9 a.m. Friday, May 31, at the Manatee County Judicial Center, 1051 Manatee Ave. W., Bradenton.